This corner of my shed site is to share with you what I am currently working on. Five link suspension and new wheels for Project Phoenix. When I read about the new Suplex 5 link rear suspension a couple of years ago I thought it sounded great but it’s not really traditional Morgan so I decided to stick to the original cart springs. Move forward to now and that has all changed with the factory now building all new Roadsters with a 5 link suspension. I decided to bite the bullet and fit a complete set of upgraded front and 5 link rear suspension from SSL, the British company which now supplies Morgan with components and carries what was formerly the Suplex brand. 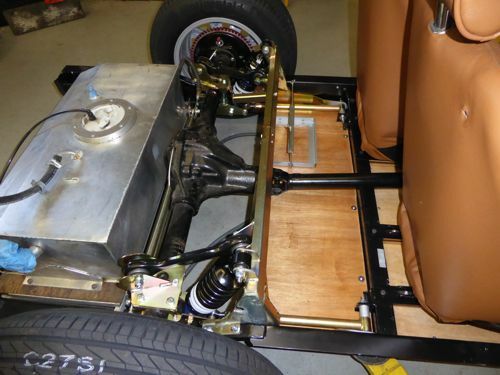 This was a big investment but with the chassis unencumbered by a body it was the ideal time to fit these components. SSL shipped the parts (44kg) to me and have been most helpful throughout. The parts reflect their premium pricing - beautifully made. 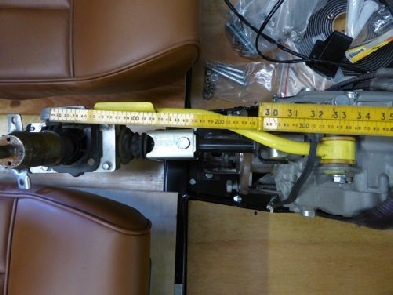 The photo shows the 5L as installed in the Project Phoenix chassis which is early Plus 8. I have also bought a set of 15” x 7” Australian made Superlite wheels. Ordered with an offset which allows plenty of room for an upgraded exhaust system. 3.7 V6 motor and Transmission installed in Project Phoenix chassis. On 31st December I completed the rebuild of the 3.7 Roadster V6 engine. This comprised a new short motor, new timing cover, new RH cylinder cover, new aircon compressor, new harmonic balancer, RH head cover and a few other bits and pieces. All parts were purchased from Ford dealers in the USA. The original cylinder heads, alternator, water pump and LH cylinder head cover were moved from the old (damaged) block. Next step is bolting on the flywheel, clutch and transmission and fitting it all into the chassis. Whilst waiting for the engine parts to arrive from the USA for my V6 engine rebuild I decided to modify the remote gear lever extension on the 6 speed MT82 transmission. Most owners of the 3.7 Roadsters would acknowledge that the gear lever position on those cars is less than desirable, being too close to the driver and often meaning that when engaging 2nd, 4th or 6th one’s elbow hits the seat cushion. The whole experience being akin to trying to eat a meal on economy air travel. Later roadsters do not have this problem as the factory modified the original mustang gear extension to move the gear lever forward. This is quite easy to do however the gearbox/transmission tunnel needs to be modified as does the trim. As I have neither the tunnel or the trim I decided to go ahead and modify the extension. The pics below show before and after the modification which moved the gear lever 70mm forward, approximating the gear lever position in my ‘75 Plus 8. By removing the centre transverse swivel point the feel of the gearchange is also improved. My design was based on several aftermarket gear selectors for the Mustang which either eliminate or reduce the number of swivel points. Left pic shows the original gear lever extension. Right pic shows the modified extension moving the gear lever 70mm forward. I plan to write this up in more detail in the “How Tos” pages. I have now installed an electro-hydraulic steering rack in the Project Phoenix chassis. I will be doing a full write up of how this was done shortly. I have been intensively researching options for converting Morgans from steering box to power rack and pinion. With a factory manual rack and fittings costing well over $3000 I am keen to find an economical alternative with the same centre take off design as the factory setup.. I think I have found it. More in the coming months.